Contra Corner » Alexis Tsipras—-Angel Of Mercy Or “Trusty” Of The Central Bankers’ Debt Prison? Alexis Tsipras----Angel Of Mercy Or "Trusty" Of The Central Bankers' Debt Prison? Greece, Europe and the world are being crucified on a cross of Keynesian central banking. The latter's two-decade long deluge of money printing and ZIRP has generated a fantastic worldwide financial bubble, and one which has accrued to just a tiny slice of mankind. That much is blindingly evident, but there's more and it's worse. The present replay of high noon on Greece's impossible mountain of debt clarifies an even greater evil. Namely, that the central bank printing presses have also utterly destroyed the fundamental requisite of fiscal democracy. To wit, in the modern world of massive, interventionist welfare states, fiscal governance desperately needs an honest bond market. The latter is the only mechanism capable of taming the modern state's primal urge to entitle, transfer, indulge, placate, subsidize and spend without the parallel pain of a commensurate burden of taxation. Soaring bond yields and the fear of losing debt market access, therefore, are the one force that can cause the politicians, thieves and charlatans who man the machinery of democracy to sober-up and acknowledge the facts; and then to weigh the difficult options and tradeoffs, congeal a consensus and close the deal. This proposition is based on experience, not theory------even though the logic of bond market discipline is unassailable. Approximately 33-years ago, in fact, I was part of a small group of White House staff who talked Ronald Reagan into the impossible. That is, into signing not only a giant tax increase bill at the dark bottom of the 1982 recession, but to actually embrace several more such measures over the course of the subsequent three years. When the dust settled, these so-called "tax grabs" took back fully 40% of his cherished and sweeping 1981 tax reduction. President Reagan crossed his own "red lines" because, at the end of the day, he knew Paul Volcker wouldn't print the money to finance the giant 6-8% of GDP structural deficits that broke out during the first year of his administration. To be sure, these giant deficits were accidental----owing to too much defense spending, too little domestic cutting and too great a depletion of the revenue base in his historic 1981 tax cut----not purposeful Keynesian deficits. But they were nonetheless real, intractable and economically corrosive. And to his credit, the President didn't actually want Fed Chairman Volcker to ease the intense upward pressure on interest rates and private investment that these giant deficits imposed. Ronald Reagan was thoroughly old-fashioned enough to hate the idea of monetization. That is to say, central bank imposition of financial fraud on the people by paying for the state's consumption of good, services and labor and its transfer benefit payments with credits conjured from thin air. But three decades latter, the world has been turned upside-down. The bond vigilantes who kept politicians semi-honest in days of yore have been exterminated by central bankers wielding giant bond buying bazookas. Sovereign debt markets have become financial whore houses. That baleful condition is owing to the usurpation of the world's central banking machinery by Keynesian academics and apparatchiks. The whole modus operandi of the latter is nothing less than effecting the deep, chronic and unrelenting falsification of bond prices. And they accomplish this falsification not merely by direct bond buying in the guise of QE. That is bad enough, of course, as underscored by the fact that the world's central banks have expanded their collective balance sheet from $6 trillion to $22 trillion over the past decade or so. That's a whole lot of monetization-------and almost all of that $16 trillion of central bank credit conjured from thin air went into the purchase of sovereign bonds, notes, bills and numerous forms of other state guarantied debt. These crackpots tell you, of course, that a brobdingnagian $16 trillion thumb on the scale has nothing to do with the price and yields of public debt. We are supposedly suffering from a "savings glut", according to Bernanke and Greenspan; and by the lights of the greatest Keynesian gasbag of our times, Professor Larry Summers, ultra-low rates are owing to a mysterious secular stagnation that has induced investors to beg governments to issue them negative yield securities. Right! Still, this massive direct monetization of sovereign debt is only the half of it. ZIRP is the dastardly accomplice of QE. Even more price falsification is introduced into the government bond market when the johns who run the whorehouse finance their speculations in the repo and other liquid money markets. The expense of carry on the 95% or so of the bond's purchase price which is borrowed amounts to the cost of production (COGS) for bond market speculators. Make that COGS zero for 80 months running and pledge on a stack of post-FOMC meeting statements that you will not allow money market rates off the zero bound without ample warning and you have a no-brainer yield curve arbitrage like never before imagined. And do this on a global scale, and you get the recent absurdity of the 10-year German bund trading at 5 bps of yield, or the long-term issues of the quasi-bankrupt state of Italy trading at under 1%. So rather than loathing monetization as did much of Wall Street during Ronald Reagan's day, today's traders feast on it and worship it. Instead of acknowledging the false price signals and free lunch corruption it introduces into the fiscal arena, our Keynesian central bankers dismiss the danger by resorting to a red herring. Namely, that massive monetization has not caused CPI inflation to accelerate. So do not be troubled. That is pathetic beyond words and today's Greek showndown provides a striking example of how this monetary evil-doing imperils the very essence of political democracy. In a word, Greece bankrupted itself years ago because its politicians were served up heaping piles of cheap bonds by a so-called debt market that had been falsified by the ECB. Thus, in 2001 Greece's public debt was about $150 billion and equated to exactly 100% of its nominal GDP. In a world in which bond vigilantes had not yet been euthanized by central bankers, what happened next would have been impossible. By 2010, Greece's public debt had soared to $380 billion, meaning that it grew at a compound annual rate of 10% for an entire decade. Needless to say, nothing had changed with respect to Greece's notoriously corrupt, inefficient, special interest dominated economy that would have warranted a $230 billion surge in public debt-----especially given the 100% of GDP starting ratio in 2001. Yet Greece's 10-year bond yield dropped dramatically until 2008, and even by the time of the crisis fully hit in early 2010 it was only 5.5%. In the interim, the ECB had opened the spigots wide. During the same 11-year period ending in 2010, it balance sheet soared by 3X, representing a 11% annualized growth rate. In short, the printing presses in Frankfurt so drastically falsified euro bond prices, that even with a yield premium, the Greek state was able to borrow itself into bankruptcy. Stated differently, there is not a snowballs chance that Greece would have been lugging around $380 billion of public debt by 2010 in a honest bond market. Moreover, real bond vigilantes would never have been fooled by the phony debt-fueled boom that temporarily bloated the Greek economy during the first decade after it adopted the euro. Specifically, between 2001 and the 2009 peak, the Greek economy appeared to surge----with nominal GDP expanding from $150 billion to $340 billion or by 10% annually. But that wasn't sustainable organic growth; it was a debt fueled bubble of public and private construction investment and new household consumption on the part of Greece's legions of public employees and social beneficiaries. Not surprisingly, Greek politicians got exactly the wrong message from this phony boomlet. The latter ballooned the denominator of the public debt ratio (GDP), generating the appearance that it was only creeping up slowly to about 115% by 2008---- when in fact the true ratio was soaring. Consequently, since there was no crisis on the horizon and yields were still eminently manageable, politicians---especially those of a nation addicted to leftist statism---did what they invariably do. Namely, they drastically increased pensions and other social welfare programs. And this gets to the heart of the stupid debate between Syriza and the troika apparatchiks about "austerity". 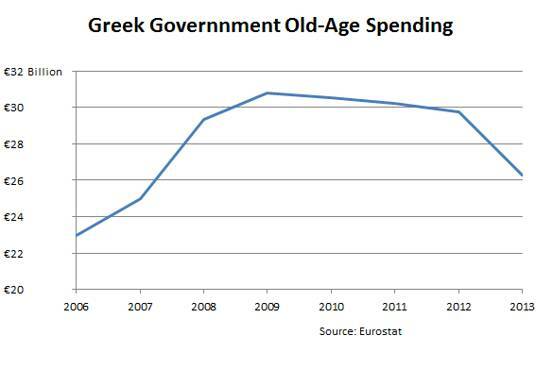 Yes, as shown below, Greece has actually reduced nominal outlays for its pension and old age programs by 6 billion euro or 16% since the peak in 2009. But in the prior three years alone it had increased outlays by 35% and by upwards of 60% since joining the eurozone. The so-called rollbacks and pension cuts, therefore, actually amount to the recoupment of the huge, unaffordable largesse that Greece's governments were induced to dispense based on a bubbling economy and the false bond market prices enabled by the ECB. Stated differently, today's pension "red line" is an artifact of a dishonest bond market, not evidence of Greece's original fiscal sin, as viewed by its German paymasters, or social justice, as claimed by its current government. In this context, it is also evident that the "austerity" to which Greece has succumbed is not the result of elective fiscal policies that have been shoved down its throat by the Troika. The hoary argument of the Keynesian commentariat that Greece's debt problem is the result of its shrinking GDP is mathematically correct but economically ludicrous. Greece sustainable GDP was never $340 billion in 2008; that was a debt financed mirage. The shrinkage of its GDP toward $200 billion at present simply represents the liquidation of a bubble economy that was totally dependent upon massive and continuous new injections of debt. To pretend that this mirage can be restored by the elimination of the fiscal constraints being imposed by Greece's paymasters is exactly the kind of Keynesian fairy tale that afflicts fiscal policy all around the world. This is not to say that the Brussels/Frankfurt/IMF bailouts and control regimes have any merit whatsoever. They have saddled Greece with illegitimate, onerous, predatory debt that it should have shed by default in 2010 once it became evident that Greece was bankrupt. The $380 billion of gross public debt that existed in 2010 should have been shrunk to a fraction of that amount in the course of a proper bankruptcy. As it happened, most of that debt was simply transferred from the banks and bond managers of Europe to the taxpayers of the eurozone. The elected politicians of Greece did not want this bailout in the first place; it was forced on them by French, German and Italian authorities in order to bailout their own financial institutions. All that has occurred since then has been a giant farce and con job. Greece's current public debt ratio is indeed 180% of GDP, and no one in their right mind could possibly believe it can be serviced over the long haul. Eventually, interest rates must normalize and then some----or the Keynesian fools now in charge of the central banks will blow-up the world's entire monetary system and financial structure. But add 300 or 500 basis points to Greece's debt service cost upon the eventual rollover of the massive Troika obligations (@ $300 billion) and the whole edifice of debt goes pear-shaped. Given that reality, the idea that Greece can work out from under its massive debt burden by running 1%, 3% or even 5% of GDP primary surpluses is pure bunk. The whole Troika program, therefore, is a monumental exercise in kick the can which will only end in disaster. So if there is to be any remaining hope in the world for both political democracy and honest capitalist prosperity, today's malignant regime of Keynesian central banking must be struck a death blow. That is, it must undergo a catastrophic failure capable of thoroughly and permanently discrediting it in the eyes of financial gamblers and politicians alike. The endless Greek default drama---which is now just going through another temporary iteration--- provides exactly that opportunity because all along this mindless, juvenile farce has been enabled and nurtured by the ECB. Draghi and his posse of financial dimwits have created what amounts to a hideous financial scam----a disgrace to any notion of central banking which existed before 2008. Had he not announced he would massively monetize euro sovereign debt in July 2012, Greece would have been bankrupt long ago, and the peripheral borrowers like Italy, Spain and Portugal would have had their day of fiscal reckoning, too. The eurozone would have blown sky high, and the ECB would be no more. Likewise, were not the ECB now supplying $125 billion of funding to the Greek banking system---or actually more than its current level of fast vanishing deposits----the latter would have crashed and burned months ago, thereby triggering a crisis which would have eventually destroyed the euro. That's the essence of the issue. If Greece's democracy is to survive, it must be cut loose from the destructive regime of superstate dictation from Brussels and monetary falsification from Frankfurt. Ironically, going back to the Drachma would put Greece's politicians right were they were before they were betrayed by the false monetary regime of eurozone central banking. They would be forced to run a primary surplus because they would not be able to borrow on world markets after a massive default on the debt forced upon them by the eurozone, ECB and IMF. But the mix of taxing the rich, cutting the pensioners, catching the tax cheats, selling state assets, shrinking the bureaucracy and squeezing the crony capitalist leeches which feed on the Greek state would be up to them, not the inspectors and pompous bureaucrats from the IMF and European superstate. More importantly, faced with a honest bond market and real bond vigilantes, the Greek state would rediscover the requisites of sustainable fiscal governance. If they should ever again choose to run large fiscal deficits in the future, they would have to deal with an altogether different kind of committee. Namely, the pricing committee of their bond underwriters syndicate. If the bond vigilantes needed a 15% yield to buy the state's debt based on the facts and fiscal prospects at hand, there would not ensue months and years of can-kicking, phony restructuring plans and promises and endless PR maneuvers and leaks to the financial press. Greece's politicians would be required to either hit the bid or cut the pension checks the very next day. Tsipras is now confronted with this kind of hard choice in an altogether different venue. If he sells out Greece one more time to the paymasters of his country's crushing debt, it will be only a matter of time before another Greek prime minister will be forced to walk the same plank on which he now totters. By doing what's right for Greek democracy, by contrast, he would prove to be an angel of mercy. There is no way that the euro and ECB could survive a Greexit, nor could worlwide Keynesian central banking survive the blow of their demise. No wonder the assembled powers of the world will move heaven and earth in the days ahead to keep Greece locked in the debtor's prison that has replaced honest free markets in sovereign debt. To this end, they may yet turn Tsipras into a faithless "trusty" of the wards, but to do so they will have to again make pigs fly------at least for a little while longer.